At first look Nikon's UP300 headset is just that, a pair of stylish cans. But look closer. These aren't just any headphones, these are multimedia playback headphones that also support connection to the web. That's right, Nikon has announced to the world that it has gone down the PMP route, but with a twist. The company has managed to put all the gubbins associated with portable media players into a single, compact unit that you wear on your bonce. 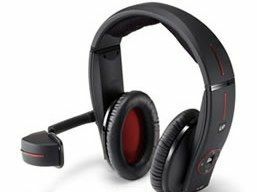 The headset sports a display – via an attached small viewing screen – equivalent to that of viewing of a 50-inch large screen from a distance of three metres. Also included is Wi-Fi capability, and high-capacity memory - up to 8GB. At the moment, this innovative piece of technology will only be available in Japan (it was announced at Ceatec), so if you fancy a pair and don't mind looking like an extra out of Universal Soldier, you will have to go down the import route.